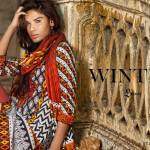 Zainab Chottani by Shariq Textiles Winter Collection 2014 with Prices has been launched today on dated December 15. Shariq Textiles new range of designer wear winter collection by designer Zainab Chottani now in stores nationwide. 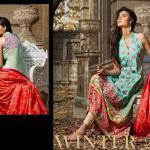 Zainab Chottani winter collection 2014 is the perfect dresses for party wear and formal wear winter collection. Shariq Textiles is the Pakistan’s top famous and emerging textile manufacturer, always teamed up with top fashion designers and introduced diverse seasonal collections, more than three unique and exceptions designer wear collection every year and every season. Now Shariq Textiles introduced its new winter range with the collaboration of Pakistani fashion designer Zainab Chottani. 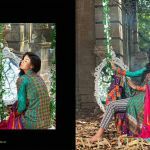 The collection is titled “Shariq Textiles Zainab Chottani Winter Collection 2014-15“, especially designed for young girls and fashionable women who needs stylish and comfy dresses to wear on this winter season. Each design is available in two to three colors variation in Zainab Chottani Winter Collection 2014 by Shariq Textiles. The dresses are in un-stitched three piece suits with embroidered patterns over shirt necklines, shirt border, shirt back or front side and sleeves. Three piece suits includes printed and embroidered shirt piece, woolen shawl and dyed shalwar piece. The price of each suit is PKR. 4750 (Four Thousand Seven Hundred and Fifty Pakistani Rupees). The most striking winter color tones are incorporated in Shariq Textiles Zainab Chottani Winter Collection 2014, the color combination includes best bright color scheme like royal blue, deep red, purple, pink, brown, orange, yellow, green, grey and parrot. The collection now ready for sale at all Shariq Textiles stores all over Pakistan. You can also purchase Zainab Chottani by Shariq Textiles latest winter collection from the brand official website store through credit card and cash on delivery services. 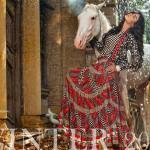 See here Pakistani fashion designer Zainab Chottani latest winter collection with the collaboration of Shariq Textiles. Check below here complete designs catalog pictures.